Later this month we will be marking Mental Health Awareness Week which is led by the Mental Health Foundation. Running from 16-22 May 2016, this year the theme is relationships. The theme was chosen to highlight the need to form and celebrate our relationships. Having a support network of friends, family, doctors or other professionals who can help support good mental health and wellbeing can make a real difference. If you would like to explore how relationships can be a strong tool in looking after your mental health, download the leaflet above which has some simple tips including making time for relationships and recognising when some relationships might be unhealthy. One of the most important relationships you might find is the one you have with yourself- do you take enough time out of work and studying to relax? Are you kind enough to yourself? With the mounting pressures of attending university and college while living with mental illness, it is all too easy to feel “not good enough” or to blame yourself when things go wrong. Learning to like yourself, being proud of your achievements and forgiving mistakes are all things which you will find can really help you develop a strong relationship with yourself. Good relationships don’t just benefit your own mental health but are also important for those around you. Being more present and investing time into relationships with others can allow you to have a positive impact on their mental health too. Sometimes all it take is for someone to not only listen but to really hear what someone has to say. 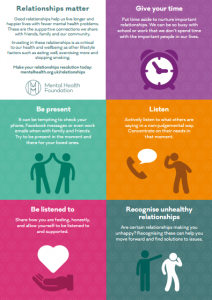 The Mental Health Foundation are calling on us all to make a Relationships Resolution– this could be committing more of your personal time to visiting family or aiming to put down your smartphone when out socialising with your friends. 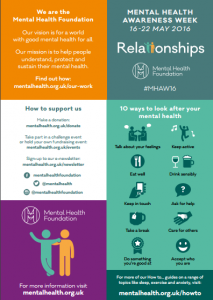 You can share your #RelationshipResolution on the Mental Health Foundation website or connect with the #MHAW16 hashtag through social media. During the week they will be posting stories and information on Facebook, Twitter and Instagram. Want information about managing your mental health while studying? Read about self-management and download our Self-Management Resource.